On Life, Love & Accidental Adventures: What is so great about America? What is so great about America? The unemployment rate in the United States has hit a 26 year high, with 14.9 million Americans out of work. Our national debt recently hit a record $11 trillion. President Obama's approval rating has fallen more steeply than any other newly elected president (ABCNEWS.com/Tapper/09/02/09). And nations all around the world believe we are big, bad bullies. Hollywood directors and stars spend more time on political soapboxes, often spouting unpatriotic or idiotic statements, than in making quality films. I pondered the answers to this question today and found myself going back in time, to my childhood. I was born and raised in Toledo, Ohio, in the shadow and amidst the exhaust fumes of the Jeep Plant and the Dupont Chemical Factory. Back then, Toledo was a small mid-western town filled with honest, hard-working, blue-collar folks of Polish, German, or Irish descent. 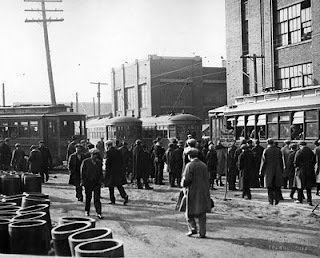 They worked for the railroad, automobile or glass factories, or the port authority. I spent summers fishing or swimming in the lake or riding my bike through one of the parks along the Maumee River. I collected old soda bottles and turned them in for cash so I could buy a foot long donut at Hinkle’s or a hot dog at Rudy’s. I went on class field trips to the Toledo Art Museum, where I marveled at the thousand-year old mummy, and Fort Meigs, a battlefield from the War of 1812. Some of the people who know me today might find it difficult to imagine that I came from humble, hearty, salt-of-the-earth stock, but I did. Before I became a polished, pampered, well-traveled woman, I was a poor mid-western girl in pigtails and overalls who loved catching fireflies and putting them in mason jars, listening to the accordion music at the Polish Festival, and watching the glass blowers at a local museum twist and turn molten sand into spectacular objects. Sure, I have traded my overalls for designer denim and my pigtails for a sleek ponytail, but deep inside of me beats the heart of a simple, proud, patriotic mid-western girl. I love that I was born in Toledo. Not because it is home to one of the oldest minor league baseball teams in the nation (Go Mud Hens!) nor because it has grown from a sleepy little town to the fourth largest city in Ohio. I do not proudly claim Toledo as my hometown because of its world class art museum nor because Jamie Farr brought it (and Tony Packo’s, a Hungarian hot dog joint located on the east side of town) fame by repeatedly mentioning it on the television show M*A*S*H.
It’s that proud, resilient, never-say-die spirit that makes Toledo a great city and America a great nation. That spirit is what saw us through the bitterly cold nights at Valley Forge, the devastating, hungry years of the Great Depression, and those horrendous days following the attacks on Pearl Harbor and the World Trade Center. That spirit motivated the men who stormed the beaches on D-Day (and helped liberate most of Europe). It is the same unflinching-in-the-face-of-peril spirit that is motivating the men and women serving in Afghanistan. Accuse me of being a Pollyanna, of looking at my corner of the world through rose colored glasses, but I believe that tough, brave, determined spirit exists in most Americans. I believe it is a part of our DNA. Although I have only been back to my hometown once in twenty years, I still consider myself a Toledoan and I still consider it one of the best cities in America. The University of Toledo and Bowling Green State University received grants recently for solar and environmental research. So, a town that once manufactured as much pollution as it did consumer products is now transforming itself into a center for the research and development of green products. What is so great about America? Its citizens. We are resourceful, ambitious, hard-working, enterprising, and indomitable. We are capable of weathering any storm because we draw on our strengths and never, never say quit. Give us a beachhead and we will take it (retreat is not in our vocabulary or history). Give us darkness and we will invent a light bulb. Give us lemons and we will create bottled lemonade manufactured and distributed worldwide. And, give us a down-trodden, rusty old industrial town and we will transform it into a revitalized center for new age research. I'm reading "What's So Great About America," by Dinesh D'Souza. Highly recommend it you and all your blogsters.